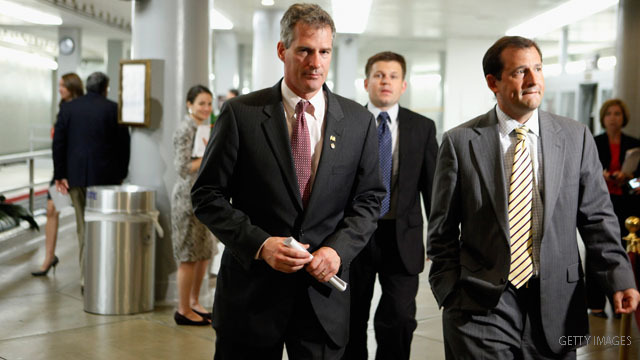 Washington (CNN) – Sen. Scott Brown of Massachusetts announced Monday he opposes fellow Republican Paul Ryan's controversial plan to overhaul the Medicare health care program for seniors. "While I applaud Ryan for getting the conversation started, I cannot support his specific plan – and therefore will vote 'no' on his budget, Brown wrote in an op-ed appearing in Politico. Democrats believe they have had so much political success hammering House Republicans on the Medicare plan that Senate Democrats plan to hold a vote on it this week to force Senate Republicans into what Democrats believe is an uncomfortable position – go on record for or against the proposal. "The reality is simple. Their party owns this proposal to end Medicare. Republicans clearly want a mulligan on the whole idea, but they cannot hide from the vote in the House. By the end of this week it will be clear to the nation which side but Medicare on the chopping block, which side stood up to defend it,” Senator Chuck Schumer, D-New York, told reporters on a conference call Monday. For anyone 55 years or younger, the Ryan Medicare plan would replace the current system with new lump sum payments for private coverage. Brown, facing a tough re-election battle next year in the historically Democratic state of Massachusetts, said he opposes his party's plan in the House because he worries it will end up costing seniors more. "I fear that as health inflation rises, the cost of private plans will outgrow the government premium support- and the elderly will be forced to pay ever higher deductibles and co-pays. Protecting those who have been counting on the current system their entire adult lives should be the key principle of reform," Brown wrote. He also argues that Medicare has already taken "significant cuts" to help pay for the Democrats health care plan passed last year. Brown even borrows a turn of phrase from Democrats against the Medicare plan, saying "I do not think it requires us to change Medicare as we know it." After Brown declared his position, Sen. Richard Lugar of Indiana announced his plan to vote for the Ryan budget Monday. Lugar is up for re-election in 2012 and his seat has been named as a target by the Tea Party. Sen. Susan Collins of Maine has stated she will vote against the plan. Another GOP member to look for is the other Maine senator, Olympia Snowe. Both not only face potentially tough battles to keep their seats out of Democratic hands, they also both have potentially serious primary challenges from the right in their own parties. But the reality is most of the Senate's vulnerable members this year are Democrats, not Republicans. Still, the Ryan Medicare plan has been so controversial – even within the GOP – that Democrats are practically giddy about forcing the vote on it this week in the Senate. "Republicans clearly feel that this Senate vote is a lose, lose for them. On the one hand, enough top Republicans will vote for the House plan so it will remain clear that it's their party's official position. On the other hand, enough rank and file Senate Republicans, particularly those in more difficult races, will decamp and it will bolster Democratic arguments that the plan is extreme," said Schumer. Schumer also said Democrats will cast this issue as a reason to keep Democrats in control of the Senate – a way to fend off what they describe as extreme Republican proposals. Meanwhile, Senate Republicans plan to counter the Democratic move by forcing a vote on the budget President Obama sent to congress earlier this year. The GOP goal there is to get Democrats on record supporting a plan that doesn’t do much to cut spending or address the high cost of entitlements. A Democratic source told CNN the expectation is most Democrats would vote against that, since the president’s budget does not include the broad goals the president laid out months later, to cut the deficit by trillions of dollars. Republicans will also argue that Senate Democrats are shirking their responsibility, since they are in charge of the Senate and have not yet produced a budget blueprint of their own. At least there is ONE republican with a thinking mind. Republicans are such ripOFFS. Michael Cannon on C-Span Washington Journal this a.m. was full of the same old insurance industry rhetoric/misrepresentation that caused most of the health care cost problems we face today. He claims it's always been illegal for insurance companies to drop coverage on people because they get sick, but they can and should he says, be dropped if they committed "fraud" by "lying" on their insurance applications, and also that people who are dropped can sue the company. First of all, it's a known fact that insurance companies use this loophole to drop people's coverage when they get sick to maneuver out of paying forthcoming claims. They don't "discover" the "lies" on the application before they accept the customer or during all the time they're paying premiums. Also, what they call a "lie" is often their own interpretation and may be either wrong or simply a misstatement by the insured, often because the questions are confusing. Secondly, why should an iindividual insured have to sue to prove they didn't answer frauduently? Remember the innocent until proven guilty, due process of law we used to adhere to in this country? The insurance company should assume immediate liability for paying claims to the insured whose application they accepted and from whom they accepted premium payments. Then if the company believes the insured committed fraud and can prove it, then the company should sue or press charges against the insured and take them to court. What's the alternative? We have not seen an effective alternative to the Ryan budget plan. The Democrats have no viable alternative for recovering America's financial situation. Ryan's plan does the job that needs to be done. Hopefully the Ryan Paul Medicare plan passes and then the seniors will suffer. Most might expire early for lack of coverage & that would resolve all SS# and Medicare issues. Nice plan Ryan and thxs Rush limbaugh for making sure nobody from the Republican party can oppose it. Of course when all you get is lies from the Democrats, with no media to dispute the lies and actually back-up the Democrat lies with lies of their own on Ryan's plan you will get the slow minded, especially those super slow minded who voted for Obama, to buy in. None of this kicks in if you are 55 or older, and when you turn 65 if you still want Government Medicare you can still apply for it and receive it. The Democrats and media fail to mention that in their false attack ads. Obama himself cut 500 million dollars out of Medicare to pay for his costly healthcare bill. The Democrats and media don't tell you that either. The simple fact is, if you are 54 today, by the time you reach 67, their will be ZERO medicare unless we do something to fix it. Ryan's plan may not be the best, but it is a starting point and unlike the healthcare bill shoved down our throats, maybe we can take the good parts of this bill and make it better. But knowing the mean spiritness and hatred of the Obama camp, we know this will never happen. It's perfect that Scott Brown can say it, but Newt Gingrich can't. Brown made a smart announcement and by doing so made Gingrich appear more of a fool. So, just to be clear... when Brown said how he will vote on the bill THIS TIME.... was he actually saying how he would actually vote on the bill or like last time when he said he would vote for it was he not saying how he would actually vote on the bill?